Every year for the last few years I have given a talk on the “Evolution of DNA Sequencing” at the “Workshop in Applied Phylogenetics” at Bodega Bay Marine Lab. I just did the talk and thought I would post the slides here. I note – I also added an evolutionary tree of sequencing methods which I include here as a separate animated gif too. I note I posted a request to Twitter the day before the talk pointing to last years slides and I got lots of helpful suggestions from people about what to add or change. I included links to Tweets in the talk and thanked those people on the slides. But I would like to thank everyone here too. Published originally on March 10, 2015. Updated 10/20/15 with information below and republished. Finally posted the video of the talk (recorded using Camtasia) to Youtube. It is imperfect (there are a few things I said that came out wrong .. it was late at night). But since it may be helpful to people I am posting it. Is there video available? I enjoyed the video from the 2012 event. Seems a shame not to have it on Youtube et al. 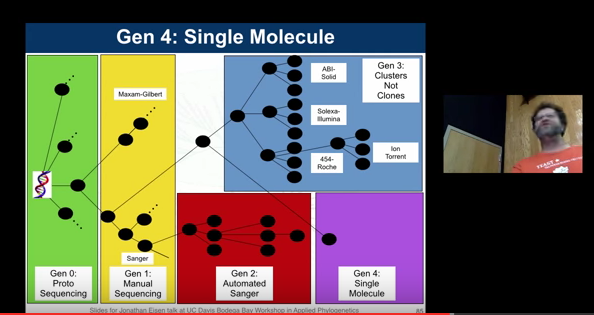 Pingback: Evolution of DNA Sequencing – microBEnet: the microbiology of the Built Environment network.